In its recent decision in the case of Moranko v. Downs Racing LP, 2014 Pa.Super. 128 (Pa.Super. June 24, 2014 Panella, J., Mundy, J., and Platt, J.)(Op. by Panella, J. ), the Pennsylvania Superior Court held that Pennsylvania law does not impose a duty upon a casino's valet service to withhold the keys from a motorist if that person appears to be visibly intoxicated. In so ruling the court upheld the entry of summary judgment in favor of the defense entered by Judge William H. Amesbury of the Luzerne County Court of Common Pleas and addressed the issue of first impression of the issue of the duty and ultimate liability of a valet service when a vehicle is returned to an allegedly intoxicated person. 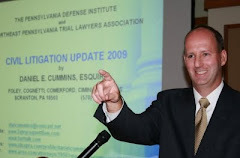 The court found that no such duty exists under Pennsylvania law and reasoned that, even accepting as true the allegation that the Plaintiff's decedent was visibly intoxicated when he retrieved his vehicle from the valet service, Pennsylvania law did not impose any duty upon the casino or its valet service to withhold keys from a visibly intoxicated patron. Applying bailment law, the court noted that the valet service was, instead, duty bound to return the vehicle to its owner when requested. Once the demand was made for the return of the car, the defendant no longer had control over the vehicle such that a duty could be imposed upon the valet service or the casino for returning the vehicle to a visibly intoxicated person. I send thanks to Attorney Scott Cooper of the Harrisburg law firm of Schmidt Kramer, Attorney Brian Bevan of the Pittsburgh law firm of DiBella, Geer, McAllister & Best, P.C., and Attorney Walt McClatchy, Jr. of the Philadelphia law firm of McClatchy & Associates for bringing this case to my attention.